2:08 p.m., Nov. 25, 2014--University of Delaware professors and students remember Alexis DeFrancesco as a diligent student who liked to sit in the front row and as an outgoing and caring friend. 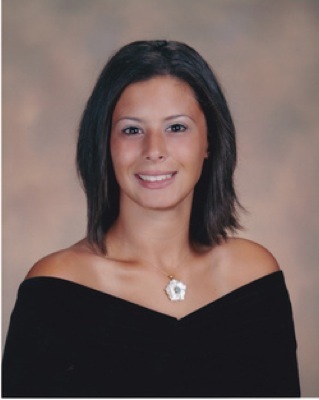 A UD senior majoring in fashion merchandising, Ms. DeFrancesco was killed in a car accident Nov. 23. The 22-year-old was scheduled to graduate at the end of the fall semester. A Mass of Christian Burial will be held at noon, Monday, Dec. 1, at Immaculate Conception Church, 522 Main St., Marydel, Maryland. Friends may call from 6-8 p.m., Sunday, Nov. 30, at Torbert Funeral Chapel South, 1145 East Lebanon Rd., Dover, Delaware. Ms. DeFrancesco's adviser, Jaehee Jung, associate professor of fashion and apparel studies, said she was a hard worker juggling schooling with various jobs, including one at Coach. "I believe she would have been great in the industry with her marketing minor and internships she had," Jung said. "She did an internship last summer with the marketing and sales department at the Dover International Speedway, and she had to commute to attend classes in September due to her internship there, but she still managed to do so and showed her dedication for her involvement." Hye-Shin Kim, professor of fashion and apparel studies, said Ms. DeFrancesco was a hard-working student and "a fun, outgoing and caring friend." Brenda Shaffer, instructor in fashion and apparel studies, recalls Ms. DeFrancesco as a student who always sat in the front row and actively engaged in class discussions. "She was very excited about graduation and had begun interviewing for permanent positions," Shaffer said. "I also remember her in the front row," said Katya Roelse, instructor in fashion and apparel studies. "Through many assignments, I learned that she was the baby of the family, that she wanted to move to San Diego with her sister when she graduated because she liked the lifestyle and aesthetic there, that she worked at a car dealership, that she loved Whitney Port, and that she wanted to do more designing one day. She also loved many different kinds of music." Fellow student Courtney McGee said, "I didn’t expect to find such a kindred spirit in someone 10 years my junior. When I met Alexis in Costume History, we bonded immediately: We laughed at the same things, had the same values and looked at life in general through the same lens. She was an amazing listener and kept her friends grounded so they would never forget how special they are. "Her dedication and her independence shine through not only in the fact that she worked at least one full-time job with a full course load, but also in the fact that she always made time for friends and family, because they were such an important part of who she was," McGee said. "Alexis made you smile when she entered the room, her infectious personality able to lighten any mood. But she was feisty and not afraid to tell you what she really thought. She would not let anything hold her back and was eager to graduate and start a career in New York or LA (as long as she could find a pet-friendly apartment for Ziggy). I will miss her honesty, her smile, her selflessness, the way she rolled her eyes when she was annoyed, the way she would tell me how everything would be 'otay.' To have to talk about her in the past tense is unjust, but we will always keep her present in our hearts and memories. Thank you for allowing me and so many others to become a part of your life. I love you," McGee said. "On behalf of the entire University of Delaware community, we extend our deepest sympathies to Ms. DeFrancesco's family and friends," said José-Luis Riera, dean of students. "We are all truly saddened by this tragic accident." Born in Dover, Delaware, Ms. DeFrancesco graduated in 2010 from Dover High School, where she played varsity field hockey and varsity soccer. She also played many years for Central Delaware Soccer Association (CDSA) soccer. In addition, she in the AFJROTC program for four years, where she excelled to group commander in her senior year, receiving many accolades and college scholarships. Ms. DeFrancesco was employed as a server at Firebirds Restaurant in Christiana, Delaware. After earning her fashion merchandising degree from UD, she planned on pursuing a career as an assistant buyer. Her family recalls her as a beautiful, vibrant, fun-loving, cheerful, determined, confident, talented and creative young woman, who loved spending time with family and friends, traveling and who loved New York City. She is survived by her parents, Keith and Anthula DeFrancesco; brother, Joseph DeFrancesco; sister, Gina DeFrancesco; grandparents, Carl and Marlene DeFrancesco; grandmother Gogoula (Joy) Saloustros; aunts, Tula Saloustros and Irene Marini; aunts and uncles: Rick and Ann Myers, Jim and Mary Voss, Scott DeFrancesco, and many cousins and friends, as well as her new puppy Ziggy. In lieu of flowers, the family suggests contributions to the Dover High School AFJROTC program or to a charity of the donor's choice. To send online condolences, click here.